VANCOUVER, BC – (July 5, 2018) – Kenadyr Mining (Holdings) Corp. (TSX-V: KEN; OTC-MKTS: KNDYF; FRA: KM0) (the “Corporation” or “Kenadyr”) is pleased to announce further results of the 2018 drill program at Kenadyr’s Borubai property comprising drill holes EZ- 3,5,7 and 8 – 18. 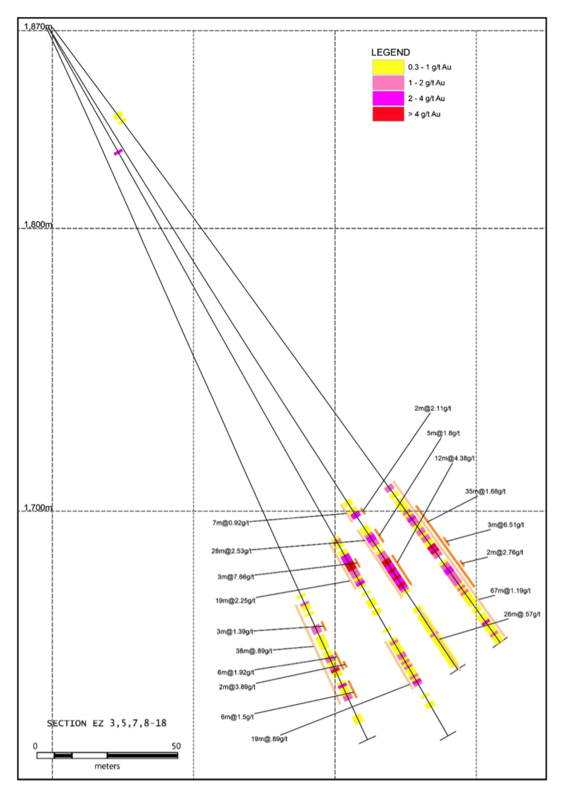 These drill holes are collared approximately 50 meters east of the last section reported at the end of March this 2018 season and further demonstrate good continuity of mineralization continuing eastward from the TBL mine. The results continue to support the extension of significant widespread gold mineralization to the east of the TBL Mine, operated by Zijin Mining. The company is now finishing the next 50-meter step out section which includes holes EZ-06 and 09-18. This next step out section will be announced shortly. As the company continues to drill out the East Zone, it will commence a table top scoping study to determine the viability of an open pit mining scenario. This will be an internal study for management’s review of the drill program. Kenadyr’s Borubai project comprises a 100-per-cent-owned exploration license covering a contiguous 164-square-kilometre land package that encircles the Zijin/KygysAltyn newly constructed and operational TBL mine, in northern Kyrgyz Republic. Zijin has recently participated in a private placement of $1,672,000 at $0.20/share to fund Kenadyr’s ongoing exploration on the Borubai licence. Zijin, the majority owner of the TBL mine, is one of China’s largest gold producers, second-largest copper and zinc producer, as well as a major producer of tungsten and iron ore (source: Zijin website). According to a news release published by Zijin. on Aug. 15, 2011, the national resources table of Kyrgyz Republic stated that the TBL field contains (C1 plus C2) 8,906,100 tonnes of gold ore (the average grade is 7.23 grams per tonne). The TBL mine is designed to produce 125,000 ounces of gold per annum. 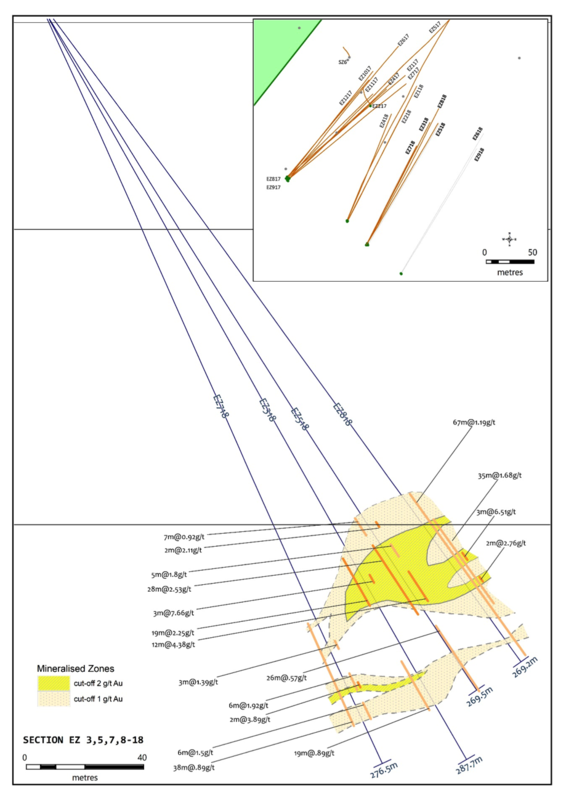 The TBL mine deposit is directly adjacent to Kenadyr’s initial drill targets, the South Zone and East Zone, which were previously drilled by the Soviets, with drilling on the Borubai License exceeding 98,000 meters. Additional information in respect of the Corporation’s business and the Borubai project is available in the Corporation’s Annual Information Form dated April 28, 2017, available under the Corporation’s profile on SEDAR.